Figure 1: CMIP5 model ensemble compared to obeservations (Hadcrut4). 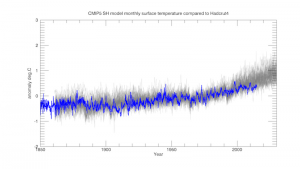 Is the pause in warming since 1998 natural ? The pause in warming since 1998 is clearly evident in Figure 1 above. This pause undermines the statement that natural variability is unimportant. Whichever way you look at it, the lack of warming for the last 18 years must be natural whatever the final explanation may be. So how well do the models actually perform at simulating such natural varaibility. This from Knudson et al. ( again thanks to SoD). In other words, any ‘natural’ trends generated by models in the temperature data are assumed to be an artifact and simply removed. This certainly does not sound to me that the CMIP3(5) models are correctly simulating natural variability. Many models have drifts which are assumed to be anomalous and need to be corrected into zero dependency. Then any resulting model structure is discarded as being an artifact. However the observed cooling from 1940-1970 and the pause in warming post 1998 are certainly not artifacts, so why reject those models that produce something similar? The drifts and structure of these models are of the same order as observed warming. 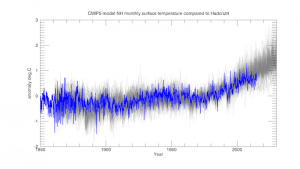 Do models correctly simulate the actual climate or do they just simulate the anthropogenic component? The AR5 attribution study depends critically on them being able to simulate both anthtopogenic forcing and natural variability. This is clearly evident from Fig 10.5 in chapter 10. 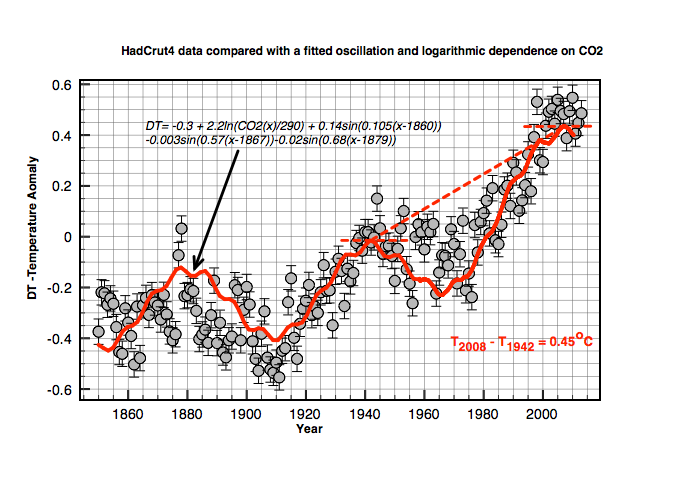 Now suppose there actually is a natural 60 year oceanic heat oscillation present – AMOC as described by Chen and Tung. This would necessarily imply that there has been a natural warming component of magnitude of about 0.2C since 1950. This is also clearly visible in a simple fit to the Hadcrut4 data including such a term. In this case the (Internal Variability) term in Figure 10.5 turns out to be non-zero and the result now looks rather different. The models now run way too warm as shown below. The anthropogenic term ANT is now no longer in agreement with the observations and the attribtion statement should be modified to account for the non-zero natural component. As a consequence it becomes clear that CMIP5 models are running about 50% too hot. Therefore the attributrion statement should now probably read instead. This could also explain discrepancies in the spatial distribution of warming. In general models and data agree fairly well that most warming occurs over land and arctic regions. However van Oldenborgh et al. show there is significant disagreement mostly over the oceans, overestimating warming in the northern Pacific and underestimating warming in the southern tropical oceans. Figures 4 and 5 show simple CMIP5 modle comparisons for the two hemispheres. The southern hemisphere is dominated by oceans and warms slower. Overall the spatial agreement on a grid spacing level is fairly good except for the last 15 years. However there are discrepencies both in overestimating warming in about one quarter of the world and underestimating it in about one third. 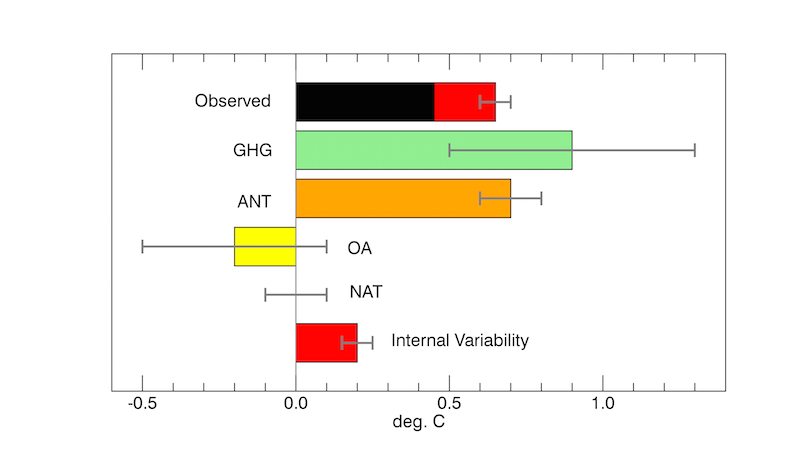 WG1 Box 9.2 AR5 admits that “Hiatus periods of 10/15 years can arise as a manifestation of internal decadel climate variability, which sometimes enhances and sometimes counteracts the long term forcing trend” followed by a long explanation as to why this does not affect ever increasing confidence in climate models. I am not convinced – nor do I suspect are some of the authors of AR5. One can only imagine the intense pressure that has been placed on them to increase the certainty of human warming, thereby maintaining the various green/governmental interests and funding lobbies for another 4 years. I wonder who will eventually jump first ? This entry was posted in AGW, Climate Change, climate science, IPCC, Science and tagged AR5, Attribution, IPCC. Bookmark the permalink. As indicated so often in the past, the IPCC climate models are nonsense, and defeated by the fundamental laws written into the fabric of the cosmos, most especially in the context of climate policy. 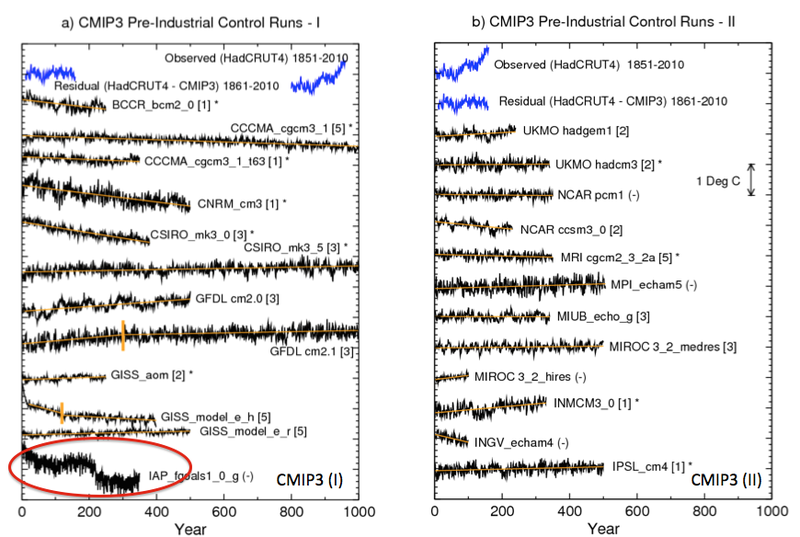 In addition, I had already noted in your blogs that the “shift” in the AR5 towards time-series models (and away from GCM’s etc), represents an even greater “own goal” by the IPCC. Time-series methods necessarily require fitting to a single period, and then the models assume that the future evolves in accordance with the parametrisation of the chosen “fitting period”. As such, one can “curve fit” to “anything” and “prove anything”, including the apparent proof of rubbish. But it gets worse still. For the AR5, the IPCC spin factory has invented an entirely new “language” which solicitors would call “terms of art” (this is not a good thing). For example, they are now careful to define new words like “projection” (v.s. prediction), and come up with a much thicker layer of “estate agent”/”used car salesman” jargon. … all to manipulate the unwary of the utter rubbish they are peddling. As indicated, I have started a new Note in my Series (http://www.thebajors.com/climategames.htm) dealing specifically with some of the new “gold standard” for “slience” (slimy science) in the AR5 … not sure when that Note will be ready. It goes into much more detail about the specifics of the cheating, self contradiction, and “careful scrubbing” of model parameters to produce the carefully engineered fear mongering results necessary for the UN/IPCC political agenda. HOWEVER, something to investigate further is this: how did they actually arrive at the numbers for their “95%” certainty? That appears to be the language of science, and one may imagine they mean by that what most scientists would mean … .namely, there is some manner of statistical data analysis to determine the confidence intervals of the results. In previous AR’s the lead authors (especially Jones et al) had a profoundly miss-represented (or profoundly misunderstood) the meaning of confidence intervals. For example, when you move your confidence intervals from 90% to 95% this means you’re LESS CERTAIN of the outcome (not more). This may sound counter-intuitive to non-scientists, but basically if you make your error bars wider, then you cover a greater range of possible outcomes … so the confidence interval “increases” because you are allowing more possible outcomes … this means LESS CERTAINTY. … but it’s a good way to cheat the public/unwary. Since that had occurred in past AR’s, I was curious and wished to determine how they came up with the AR5 “95%” certainty claim …. I could find nothing that particularly convincing that to explain how that number was arrived at. Apparently, though I don’t have the kind of proof I would like, it has nothing to do with science or data analysis … apparently it is purely the result of a “vote”. What little information I have suggests a process such as: Get 100 hard-core “card carrying” IPCC members in a room. Ask the question: How many of you believe with certainty that CC is exclusively man made? Raise your arm. Then count the number of raised arms … apparently that is effectively the kind of process by which the “95% certainty” is concluded … there is no science or data analysis. Yes the simple vote process you describe is what the IPCC call ‘expert assessment’ . Expert assessment is crucial to the AR5 attribution of anthropogenic warming given to policy makers in SPM. It is expert assessment that natural variability has been negligible since 1950. I disagree with that expert assessment based on the clear evidence of a 18 year pause in warming. Don’t you see, as soon as you move to “consensus” based “truths” you NO LONGER HAVE SCIENCE … full stop … the game is up. The pretence that consensus is permitted to drive scientific truth is one of the most evil success of the IPCC/UN spin factory, and necessary for their manipulation of the masses. Proper science only permits scientific truth via (proper) data. If you don’t have data, or the data contradicts your “beliefs” … you DON’T HAVE SCIENCE. In a very important sense, science is the antithesis of democracy. It makes no difference, in science, if 6.999 billion people unanimously and thoroughly believe that sacrificing goats to the Sun God will improve the weather. If one person has the data, then they are (scientifically) correct. If nobody has the data, there is NO science. Of course, everybody is welcome to have opinions, theories, guesses, beliefs etc etc … but the one thing you MAY NOT call that is science. Indeed, the population is free to vote for more funding of goat sacrifices … but under no (honest) circumstances can such political/policy decisions be claimed as science based. UNFORTUNATELY, the main stream of western society holds democracy, tolerance, etc as deep philosophical foundations, and so it is easy to abuse/exploit the masses. Critical to the IPCC/UN demagoguery is the pretence that their work is based in science. If their intentions were presented authentically as the political activism that it is, few would pay attention. Masquerading as “science” is absolutely crucial to hide their political agenda. Surveys have shown that, on an particular index, scientist have (or used to have) the highest degree of credibility, with and “index” value of 74, compared to a vast number of professions/vocations. The same index put politicians at an index value of 6 … i.e. virtually zero credibility. … as such, if you have a political agenda, and are honest about it, you are screwed. If you have a political agenda, and masquerade falsely as scientist, with a heavy dose of fabricated fear mongering, then you have a good chance to screw/exploit the masses. The IPCC/UN spin factory has been very successful at screwing over the masses in this way for quite some time. My “favourite” bit of evil is the utter rubbish produced by Doran and Zimmerman in their now infamous “97.4% all scientists agree” BS. … they don’t give a tinker’s cuss about the planet, you can prove this for yourself from their documents, in which all their solutions to “solving” climate change involve taking trillions more dollars from the rich countries … moving a (huge) pile of cash form one location to another does not solve emissions issues, but sure makes the UN et al much richer. … personally, I am a bit pessimistic as at the moment humans are particularly exploitable via IPCC/UN tricks due various “modern syndromes”, such as what I call Maslovian perversity etc. … still, I think we should try to put a good word in for honesty and integrity … as the old saying goes, “evil triumphs when good men do nothing”. I agree completely that science has nothing to do with ‘consensus’. Dogma masquerading as ‘consensus’ is anathema to real science. There are many examples of poor institutional consensus being wrong in the past. For example the consensus on the existence of the aether before Einstein, determinism before quantum mechanics etc. It only takes one scientist to explain the world and everyone else is wrong. The situation now is similar to the military/industrial complex feeding on cold war fears to prolong the nuclear arms race. The IPCC has created a similar fear of annihilation feeding a green environmental financial complex feeding off tax payers. THE TRUTH: overall global temp is always the same – the ”Pagan beliefs” don’t hold water. 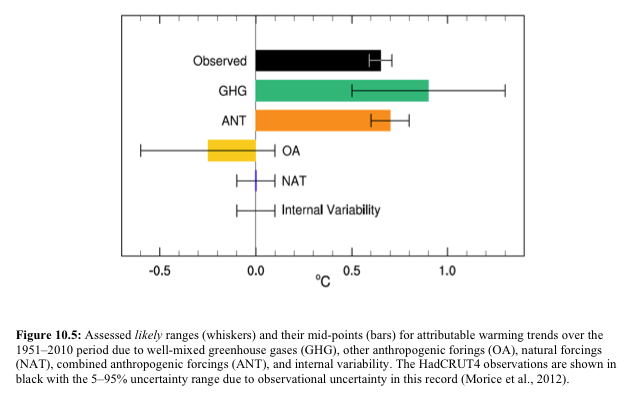 ”Natural variability” in temp are NEVER global!!! Clive, whoever confused you that: ”shortwave IR coming from the sun is same thing as the longwave IR from the kinetic heat on the earth… wasn’t your friend! That con comes from John Cook’s camp! I’m sincerely asking you for second time; to read my post and learn the correct version, the real truth (not what the Warmist want you to know). If you read my post – would be like opening your eyes, be a good sport – be fair to yourself – the more you know = the more you are worth! Never have I said ”IR comes from the sun”. IR comes mainly from the surface, GHGs and clouds, and is radiated out to space. Clive, UV &IR do come from the sun, they are in shortwave frequency and travel long distances – when they come here -> they, they vibrate the molecules and produce kinetic heat, mostly on the surface. THAT heat radiates for only few microns and oxygen & nitrogen pick that warmth and disperses in the troposphere, to be neutralized by the ”cold vacuum” that constantly penetrates into the atmosphere. I hope our argument was constructive and informative. As long as you remember: it was the dirtiest trick the Warmist used on the society, by misleading that: heat from the ground ”radiates (IR) out of space!.